This article from Erica Markus appears on the Charlotte.com website, though it appears it originally appeared in Newsday. Chicken is made up of two types of meat that cook at different rates and are considered "done" at different temperatures. Dark meat needs to get to 180 degrees; breast meat is best at 160 degrees. 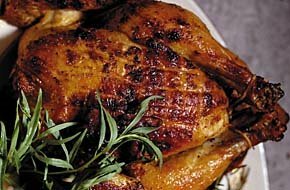 The shape of the bird isn't conducive to even cooking -- it's thin in some places, thick in others, with protrusions of different dimensions and a big hole in the center. Flank Steak - Strictly for Home Use?